Are the Mighty California King Beds the right choice for your bedroom? The California King beds might have become a staple piece of furniture at the furniture shops today. But did you know that these type of beds was last to join the game? Yes, it wasn’t until the late 1960s these gigantic beds found its way into the homes of tall dwellers who wanted to have a good amount of leg space in their beds. During that time, the California King Beds were reserved to the celebrities and athletes. Later as the popularity of these behemoth beds spread like fire, the furniture shops seized the chance to sell them to the people. What are the advantages of having a California King Beds? The California King Beds have one thing at their side – the size. This type of bed has a whopping 72 inches wide by 84 inches long dimensions. This gigantic size comes to save the taller people lie flat and have a peaceful night’s sleep. Therefore, allowing the sleepers higher foot space. In many houses, the master bedroom would be generous with space. In order to come up with apt furniture to space ratio, a big bed would the best fit. 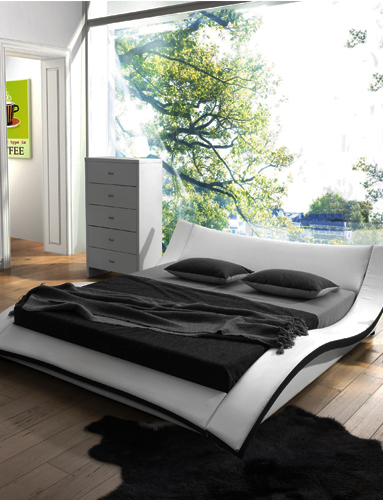 Also, this type of bed would be suitable to place it anywhere in the room. Unlike a small bed which tends to depend on placements, these king-sized ones don’t depend on the placements much. With the fame of the California King Beds, the mattresses for them has also come in wide range. The memory foam one, spring bed and so and so. Thereby giving you a range of options when it comes to choosing a mattress. At Furniture Coast to Coast, the California King Size Bed has a great wooden frame with ornate details. The headboard of the bed is also big enough to support your pillows and at times your back when you relax and chill by watching TV or Laptop.